Samuelson, Don A.; Brooks, Dennis E.
In this volume, the latest in the bestselling series of self-assessment color reviews, the authors provide systematic coverage of the subject as randomized self-assessment case presentations: integrated questions, superb illustrations, color photos, imaging, diagrams, tables and detailed explanatory answers. 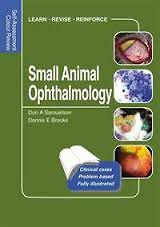 There are 251 illustrated cases and the authors have emphasized the more common ophthalmic conditions presented to veterinarians in practice. The differential diagnoses, examination techniques, and therapies for these ocular conditions are discussed within specific cases. While ophthalmic problems relating to dogs and cats are often similar, this is not always the case. For that reason, the authors have distinguished the canine cases from the feline in the listing of the 'Broad classification of cases'. The book is designed to appeal to veterinary students preparing for exams, and to veterinary practitioners in their continuing professional development.